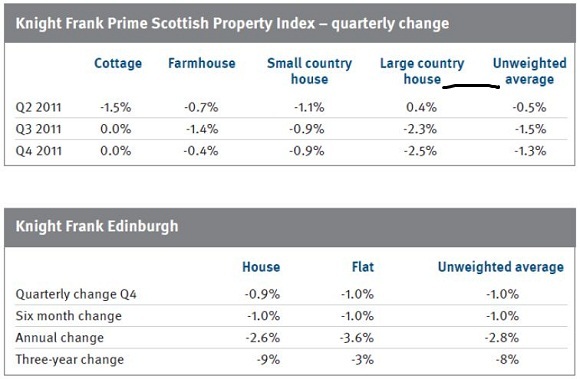 Average prices of country houses outside Edinburgh fell by 1.3% in the final three months of the year, a more modest decline than the 1.5% decline in the third quarter. Average prices are down 3.2% year on year, but this masks some regional variations. Prices in the Scottish Borders have been resilient, rising by 0.2% between October and December, and 1.2% year on year. But the South West of Scotland has suffered larger falls, with prices down 7% year on year. 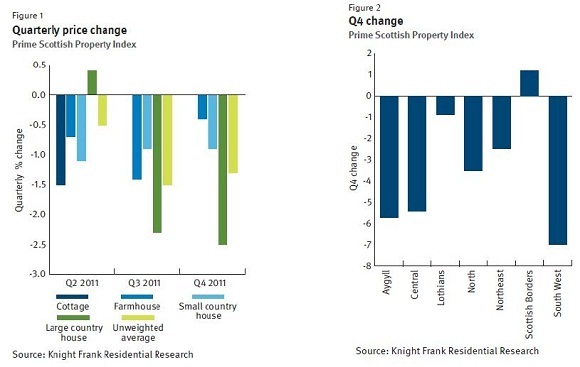 Ran Morgan, Head of Knight Frank’s Scottish residential department, said: “The prime market is hugely varied in Scotland but in general these figures show how tough market conditions have been in 2011. The further you go from London the more difficult life has been. “As usual in such tough fiscal conditions, a two tier market develops. The best houses in the best areas continue to fare well. Oil has supported Aberdeenshire with some phenomenal prices paid for town houses in the City. Rural Aberdeenshire within commuting distance of the City has also done well with Midmar Castle being the marker sale of the year at circa £3m. “Perthshire has also performed relatively well as long as the properties are of quality and well-priced. There has been no shortage of trade within the Central Belt which mainly appeals to domestic buyers but again this is incredibly price sensitive. Fife, Kinross and Stirlingshire have performed better than their commuting cousins south of the Central Belt. Matthew Munro, partner in Knight Frank’s Scottish residential department, adds: “Although values in Edinburgh’s prime residential market are down, activity has been steady throughout the year. The more recognised seasonal trading periods have been replaced by steady and continuous activity throughout the year with an uplift towards the end of the year. “Overseas buyers in particular are very much in evidence. These buyers clearly see Edinburgh’s prime housing stock as quality and good value. Our offices in Moscow and St. Petersburg have been particularly busy introducing buyers to our office here in Edinburgh. “Edinburgh’s residential middle market has seen the most resilience and shown genuine signs of improvement in terms of the levels of activity and volume of sales compared to the previous twelve months.